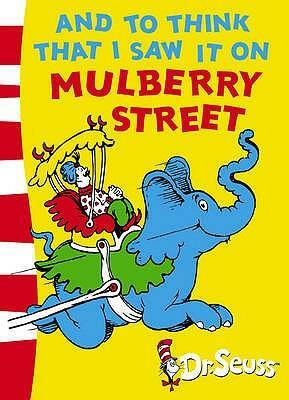 And To Think That I Saw It On Mulberry Street was Ted Geisel’s first book. Well, he’d written an abecedary but failed to interest publishers in it. It took a while to find a publisher for this one, too, but compared to what author/illustrators are up against today, I’m guessing 20 rejections is actually pretty good. Dr Seuss may never have moved into picture book world if Geisel had not ran into an old college classmate, who had just become juvenile editor at Vanguard Press. When I hear stories like this I wonder how many other wonderful writers and illustrators never see widespread success due to plain old lack of luck, and I feel the self-publishing movement is therefore a great thing. Legend has it that Geisel came up with this story on a ship. To ward off sea sickness he concocted a story. The rhythm is inspired by the ship’s engine. Of course, Geisel continued to write his picture books in that signature rhythm — a rhythm many writers have subsequently tried to pull off — perhaps more young rhymsters should take a cruise on a clunky old-timey steam ship?? The regular rhythms […] have the strong beats and obvious patterns we usually expect of pictures in sequence; and as usual in a Dr. Seuss book, the action-filled cartooning does much to break up the regular rhythms inevitable in a pictorial sequence. 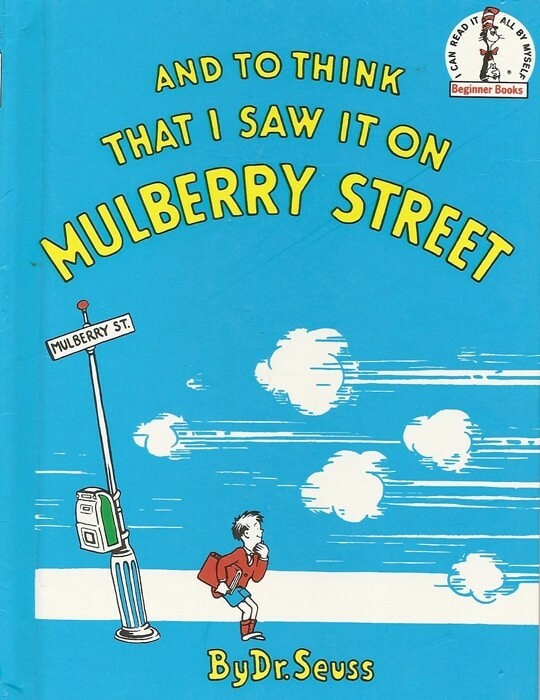 But as the boy, Marco, adds details to his complex story of what he saw on Mulberry Street, the pictures become more and more complex, more and more filled with detail — but always in terms of the same basic compositional patterns: the elephant is always in the same place on each spread, and so on. So the pictures both build in intensity and maintain their narrative connection with each other, as the words in a story usually do; in each picture we look for new information to add to old, rather than having to start from scratch about what we are seeing each time, as usually happens in picture books. At the same time, the segments of text get shorter and tend to be interrupted by more periods. The result is a curious reversal, in which the text adds the strong regular beat and the pictures provide a surprisingly inter-connected narrative intensity. Indeed, many fine picture books create the rich tensions of successful narrative in pictures that strain toward the narrative qualities of text and in texts that strain toward the narrative qualities of pictures: they have repetitive rhythmic texts, and pictures with accelerating intensity. The details in this story plant it firmly in the First Golden Age Of Children’s Literature. Modern stories of the imagination don’t tend to include Rajahs riding elephants and ‘Chinamen’. Marco is fanciful. He’ll lie about something in order to make his life more interesting. Some may see this as a weakness; the weaknesses of picturebook characters often have very benign psychological weaknesses — a big imagination is more properly considered a strength. He wants to impress his father. Throughout his work, Geisel seemed more at home writing about the typically male experience and it’s true here, too, with an understanding of how sons naturally want to impress their dads. This book, of the Tall Tale type, is an historically masculine form. The father is a kind of opponent in that he has no time for Marco’s fanciful stories. He plans to make up a story that’s far more interesting than reality. In a cumulative, imaginative, carnivalesque story such as this, there may not be any big battle between the child and the other characters. Instead, the ‘battle scene’ will be ‘the moment of extreme chaos’. This is the illustration with everything in it. In a chaotic, carnivalesque plot, ideally there will be a ‘breather’. Here, the self-revelation comes with the image of the crossroad. Note all the white space — the picturebook equivalent of a musical sequence with no dialogue in film. None of this is going on here, exactly. In modern stories (like this) crossroads have lost their spiritual meaning but remain a psychological metaphor. Marco must make a decision very soon: Will he lie to his father or tell him the truth? In other words, crossroads in modern stories mean choice. The self-revelation is that Marco has the power to make his own choice. In order to keep his father happy, the boy makes the decision to keep these fanciful imaginings to himself. He tells his father what he really saw. Extrapolating somewhat, this boy seems embarrassed about his imagination running away on him, so I expect he’ll hit adolescence soon and leave his imagination behind. The Dr Seuss collection is available as a series of apps on the App Store. These are sold as early literacy apps, with the interactivity limited mainly to words popping out above the objects shown in the illustrations. Marco appears again, ten years later, in McElligot’s Pool.